The derivation of this law is quite easy. It only require basic knowledge in trigonometric functions. Let be a triangle and let be its altitude. 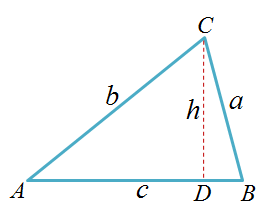 Recall that the sine of an angle in a triangle is the ratio of the length of its opposite leg to the length of its hypotenuse. Although this directly follows from the proof above, it is left as an exercise.